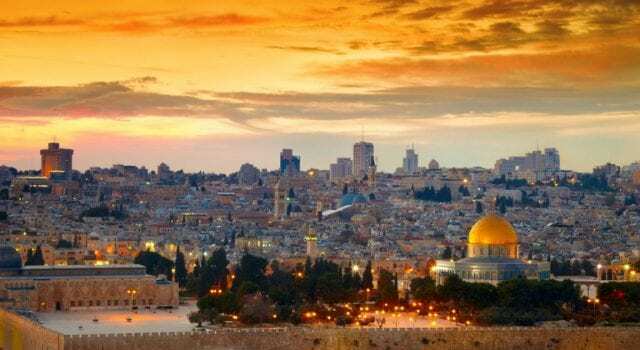 Media has it SOOOOO wrong about Jerusalem. At 1pm Wednesday President Trump will change U.S. policy about the holy city of Jerusalem. The presidential announcement will be that he is moving the U.S. Embassy from Tel Aviv to Jerusalem and he’s recognizing that Jerusalem is the capital of Israel. United States President Donald Trump spoke to Palestinian Authority President Mahmoud Abbas on Tuesday about “his intention” to move the US Embassy in Tel Aviv to Jerusalem, Abbas’s spokesman Nabil Abu Rudeinah said on Tuesday. Russia recognized Jerusalem as Israel’s capital this past April. Despite the fact that Russia was first, Israel’s neighboring Muslim nations are having a fit about the U.S. announcement. Turkey’s despotic leader Recep Tayyip Erdogan has said Donald Trump’s plan to declare Jerusalem the capital of Israel is a “red line” for Muslims and could see him breaking off diplomatic relations with Israel. Peace process? What peace process? Does the Palestinian mean the videos running on the official Palestinian Authority TV station telling their citizens to kill Jews? Or perhaps the way his government encourages terrorism by paying blood money to terrorists or their families. How about the fact that everytime the negotiations get close to an agreement the Palestinian side pulls out of talks? Arafat did it and so did Abbas. Of course, the media reports Abbas’ words without perspective, just like they present the Jerusalem issue without all the facts. For example they omit the historic Jewish presence in the city, Israel has controlled parts of Jerusalem since 1948, and the fact that Israel’s Muslim neighbors didn’t care about East Jerusalem until it became part of Israel in 1967. Perhaps it has to do with the media’s Democratic Party skew and the Democrat’s anti-Israel policies. Previous articleAnti-abortion Bill Veto in the works for PA? Next articleDoes Fake News exist ?